It all started with my love for that serie. I really wanted to make a wallpaper out of it... but how could I do something different from Dhias' wonderful watercoloured works which could match so well the serie? After rewatching the 1st episode for the 3rd time, I noticed a very brief frame where Morita runs to a garden to fetch a leaf for Hagu which looked really pop-artish by the lines and colours. I thought I really wanted to do something with that shot. I vectored it and improved some details so that it doesn't look weird for high resolutions, then added the omnipresent symbolic ferry wheel in the background (vectored from the ending) + two clouds here and there to complete the sky area. At first, I wanted to try out the Roy Lichtenstein look: using primary colors yellow, blue and red combined with screentones. It looked ok but it was just plain to put as a background and didn't convey anything in particular. After hours of research on colours with Dhias (god thanks her for her patience), I finally decided to go for a rainbow coloured wheel and a grey surrounding, including Morita (who almost ended with a pimping jaguar pattern shirt XD). I think the contrast between motions (slow moving wheel and dashing Morita) and colours shows pretty well. 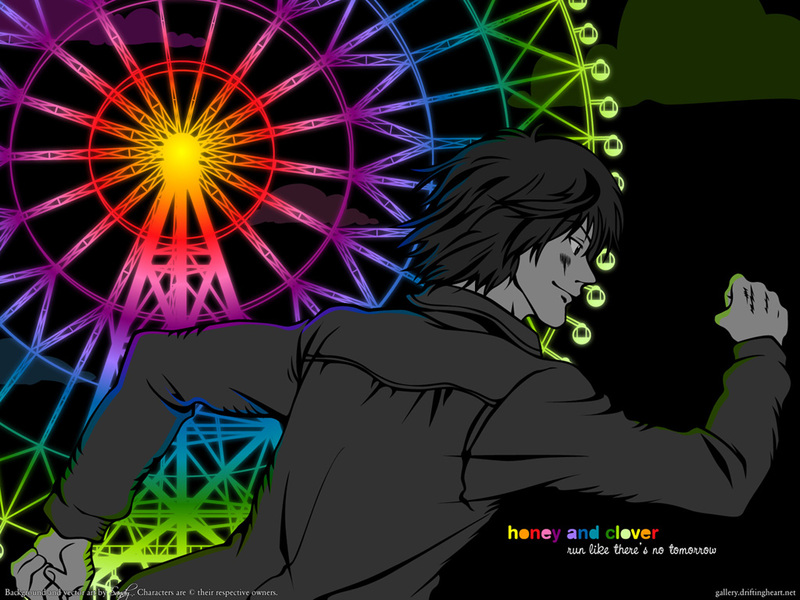 And yes, the focus of this wallpaper isn't Morita but the ferry wheel. If that's the feeling you have, then my wallpaper isn't so much of the failure I think it is. I love the simplistic feel this has (eventhough it wasn't simple, that ferris wheel must have took forever!). Excellent work, certainly an original style for wallpapers. Well done. Il y a quelque chose qui m'attire vraiment, c'est peut-être cet essai au style pop art que j'aime tant, ou le magnifique contraste qu'offre la gamme de couleurs. Quoi qu'il en soit, ce truc a quelque chose de spécial que j'adore. Félicitation! First of all, I want to thank you for walling Honey and Clover, it's a really cool and underappreciated series. I really like the idea you had when working on this. I couldn't help but smile remembering him running to get the leaf. The art style is so different from the series soft, pastel look. The contrast between the wheel and Morita is really interesting. I prefer the black and white look rather than the jaguar shirt though, it would have clashed with all the colors in the wheel. a little color here and there. I don't know the series though. but I really like the "print" look. I think you did an incredible job on this wall! 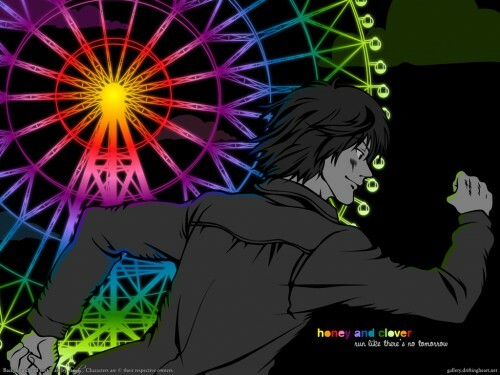 Having the character monochromatic and the rainbow ferris wheel is... genious! You have quite an eye for composition, truly worthy of a fav! Gray against the colorful wheel--great contrast and symbolism. Very nice job on this wall! And for some reason, I love the rainbow of colors reflecting off his jacket--- looks beautiful. WOW ! the colors are amazing ! Thanks ! Holy Shiie, this picture looks exactly like me...I like it, it's very nice( run like there's no tomorrrow). Morita is my favorite character! This wallpaper is exactly what i've been looking for XD Very nicely done! Thank you.